I’m treating you to one of Gerry’s Patented Guitar Rants™. 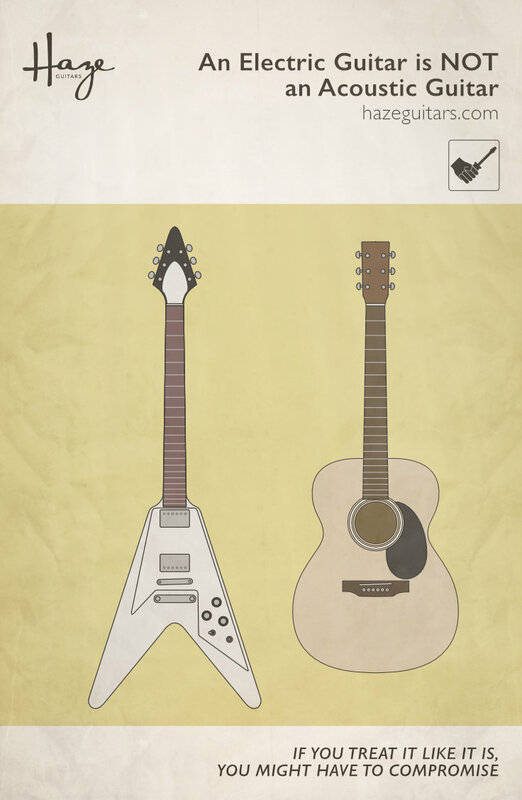 Don’t treat an electric guitar like an acoustic guitar. It’s not! Lots of guitarists will pick up their electric guitar, flop down on the couch, and proceed to play some songs without bothering to plug it in. And then they’ll call me, telling me there’s some weird buzz or rattle they can hear. Well, let me just mention: An electric guitar is not an acoustic guitar. You’ve probably noticed that the action (and usually relief) on an acoustic guitar are a bit higher than they are on an electric instrument. There’s no technical/luthiery reason for that. It’s not that acoustic guitars have bad frets or anything. It’s just because they’re acoustic. On an acoustic guitar, you have to get the top moving to make any real noise. And, mostly (not always, but mostly) players strum and pick an acoustic a bit harder to get that volume going. That means your action and relief can’t always be as low as an electric. On the electric guitar, your pickups and amp do all the heavy lifting of making big noises. You don’t need to hammer the guitar to get it to sound louder so you’ve got more scope for a slinkier setup. Also, and this is a biggie, your signal chain is very forgiving to weird little noises. That slight zing you hear from the headstock? Yeah, it’s probably not coming through the amp. That little bit of buzz? Nope, can’t hear it when you amp up the guitar. And players will often play differently when playing an electric guitar acoustically. The guitar doesn’t tend to have a lot of volume played like that so players dig in more than they might if amped up. Essentially, they play it like an acoustic. Of course, this pushes the envelope more and makes any potential weird noises more likely. It’s not an acoustic. It’s just not. If you can’t hear that weird noise through an amp, there’s a good chance it’s not a problem. But, if you feel it really is a problem — or if you absolutely must play it acoustically — you have to prepare yourself for my suggesting you raise the action, or otherwise increase tolerances to make your guitar more like an acoustic. This instrument we love is a constant exercise in compromise. My feeling is that a great playing electric guitar which has some weird noise you can only hear acoustically isn’t a bad place to be on that compromise spectrum. Grrr. Damn you for trying to fault my, always impeccable, logic. I think of these instruments as a spectrum all of their own. On one end, you have semi-hollow guitars like the ES-335, which I treat as pretty much an electric guitar. They’re set up like an electric and you should therefore have the same weird-acoustic-noise compromises in mind when you play unamplified. On the other end are the great big, hollow-body instruments. These are closer to a true acoustic but, because we’re talking here about guitars you can amplify, that pickup gives some flexibility for how you set up the instrument. You could set up for mostly acoustic playing (with its action compromises) or for mostly electric playing (with its less-forgiving acoustic-noises compromises). You should set your compromise gauge accordingly. Ok. I’ll pack things up now but will shout, “An electric guitar is not an acoustic guitar!” once more before running off with a soapbox under my arm.